The Omaha DePorres Club's pioneering efforts to challenge racial discrimination and segregation were so unfamiliar for their time that one business owner recalled their actions as "a series of impulsive, threatening and peculiar actions." The Omaha DePorres Club worked with and was known by national leaders like Lester Granger and Whitney Young of the Urban League, Roy Wilkins of the NAACP, and George Hauser and Walter Nelson of CORE. 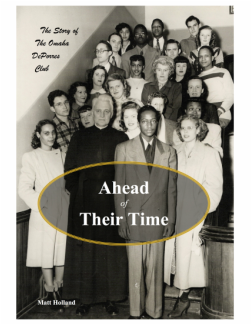 Ahead of Their Time featured on C-SPAN Book TV's Cities Tour! An in-depth interview with author Matt Holland aired on C-SPAN 2 over the Independence Day weekend, as part of C-SPAN's 2015 Cities Tour. The segment features the author discussing the history recounted in the book, artfully mixed with high quality images from the DePorres Club archive, all shot on location in North Omaha. "In his book he recounts the club’s fight for equality and the resistance it faced from both the black and white community as well as the changes they were able to make in Omaha."